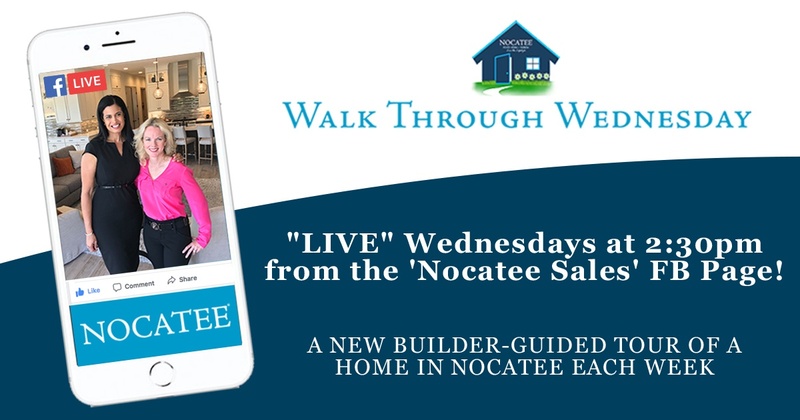 Walk-through Wednesdays... Nocatee's newest tool to empower its valued real estate professionals! Held every Wednesday at 2:30PM from the Nocatee Sales Facebook page, a Nocatee Welcome Center Representative tours a designer-decorated model home or inventory home (Quick Move-In) in the Nocatee community. The videos are designed to be enjoyed from the comfort of your own home office or couch, and give you the chance to also hear from the builders themselves. Another benefit of these walk-throughs is the chance to comment with any questions you might have about the home or neighborhood. If interested in more information on any of the models or homes showcased in the videos, please contact the Nocatee Welcome Center!